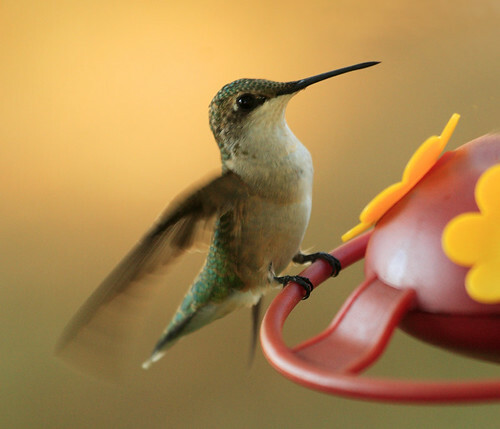 Hummingbirds can hover in mid-air by rapidly flapping their wings 12–90 times per second. They get the energy they need to maintain their high metabolism from flower nectar and sugar water from feeders. We’ve filled our feeder with 1 part sugar and 4 parts water, which is the magic formula. 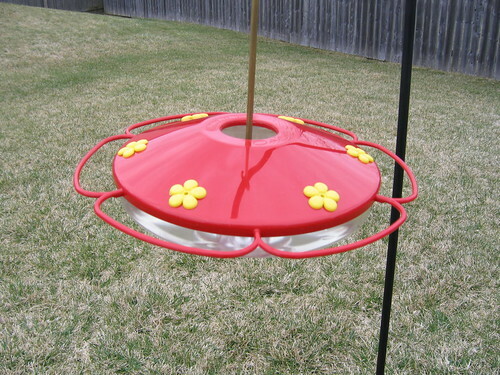 The red feeder has small holes in the shape of flowers that the hummingbirds drink from. Of course, there’s no guarantee that we’ll get them here at our new house, but we can at least try. Here are some nice hummingbird pictures from others. Hopefully we’ll be able to post our own pictures soon. This entry was posted on Thursday, April 2nd, 2009 at 10:10 am CET and is filed under Birds, Illinois	with tags . You can follow any responses to this entry through the RSS 2.0 feed. You can leave a response, or trackback from your own site. Hi! Just to let you know that I saw a hummingbird yesterday, Sunday, April 26 at 11:30 a.m. in my backyard feeder. I am in northwest Illinois in rural Orangeville (Stephenson County) — out in the country. One also came back this morning. I live in Sandwich, IL (Dekalb county), outside of town. We’ve already spotted Hummers, fluttering where I usually hang my feeders. It’s usually after Mother’s Day before we see them, so I didn’t expect them for about another week. Today (5/4), I hung my feeders and expect “company” tomorrow. We start with one or two hummers through May, but that number grows rapidly from May through September. 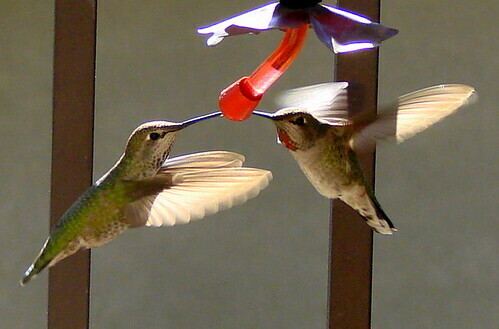 Last year, I counted 15 hummers fighting over two-feeders at one time. This year, I’ve added more feeders! Put up a feeder in Granite City on May 9, hope it was not too late to get them to find it. Also put one up in St. Peters, they are always here every year, alot of them it seems in Missouri. I live in Belleville, Illinois; put up a feeder last week and had a pair of hummingbirds within a day! We’re still trying to figure out the species. I live in South Elgin, Illinois and put up a feeder about a week ago (June 20th) and have had hummingbirds visiting the feeder almost everyday. It’s really hard to tell if they are female or male. I live in cinci. 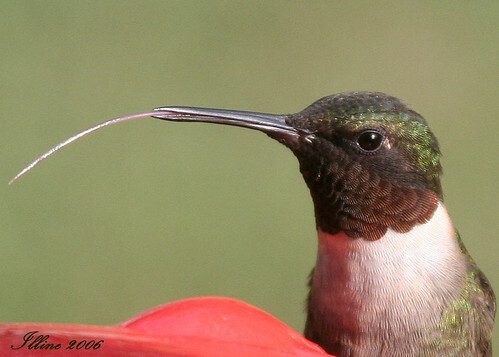 ohio — it is sept 12 2009 and i havnt seen my hummers(4/5) in several days. Have they started the migration due to the cool weather we are having? We were recently at a hummingbird festival here in the Chicago area and were advised to keep our feeders up until November, as migrating hummingbirds could be passing through until that time. I live a little west of Chicago. We are having an unusually cold October. My husband woke up this morning (October 11, 2009) to 27 degrees F. I was so shocked to see a hummingbird still at my feeder, and guarding it all day since I saw it two days before. (I did not notice any hummingbirds for weeks, and did not even bother to change the feeders for weeks. We’ve been getting a lot of cold, dark, rainy weather almost everyday). This hummingbird occasionally would chase away a second hummingbird. There could be more than two hummingbirds, but I only saw one or two at a time. I took pictures of the hummingbird at the feeders and low apple tree branches until about 6:30pm tonight (almost pitch black). It seemed extremely tame, and ignored me most of the time. The little girl hummingbird was very busy chasing small bugs and preening itself. Just hope it/they will go south soon. Does anyone know what is the normal time for Chicagoland hummingbirds to migrate south? I live in Springfield in central Illinois and spotted a female hummingbird in my backyard over the weekend (October 24th). I put my feeder back outside (I took them in in mid September)and again today October 28th I saw another female hummingbird (same?) again! It has been quite cool and rainy and I never expected to see hummingbirds here so very late in the year! Craig, she could a migrant who is just on her way south and stopped in your yard for a few days. A hummingbird bander told us that he keeps his feeders out until Thanksgiving every year as migrants will still be coming through until that time, so I guess it’s normal and not too cold for them. A red ringed hummingbird came to one of my feeds today! Yeah! My first one! Ladd, IL. 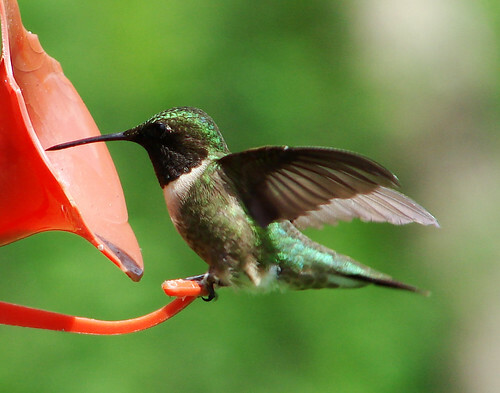 I would like to know when is a good time to start setting out the Humming Bird feeder and is there any particular solution other than sugar and water that would be good for them. Last year there was a yellow and black guy flying around for a couple of days. Anyone any idea of what type it is? Also they seem very fearless of people – is that common? Paul, it depends on where you live. Check out this year’s map at http://www.hummingbirds.net/map.html to see if the hummingbirds have reached your area. Keep in mind that map is just for sightings of Ruby-throated Hummingbirds – your yellow and black bird sounds like a different species. Hummingbirds that are used to feeding at back yard feeding stations can become habituated to humans and seem fearless, yes. I have two feeders on my front porch and I sit about 4-6 feet away and watch the hummers feed, I just now came in to send thi comment ( 2:15 p. m.} the temp. is about 70 deg. and partly cloudy. Darlene, if you were faithful about feeding them, the same ones will come to your yard next year! Just keep feeding them! And yes Mollie, it’s worth it. I have 3 feeders and usually get 15-20 hummingbirds that nest in my yard. I have tons of pine trees too, and that helps. I was wondering if you know what mo0nths hummingbirds come. I live in Ill. I just saw a hummingbird out on my back yard by my japanese rose bush (Aug 11). I live in Schaumburg IL (cook county) and I had no idea they live around here. I live in Effingham IL. crossroad of interstates 70 and 57. I feed Humming birds every year. This year was so very dry so have seen many Humming birds, at times 6 maybe more at one feeder. I have one in our front yard and one at back. We have Rose of Sharon Trees that have beautiful blooms that attract the bird. I have refilled the feeder two sometimes three times a month. I live between Cowden & Herrick IL. I have 6 to 8 hummingbirds every summer. One lady told me feeders have to be taken down by early Sept. or the birds won’t migrate. I never thought of the ones coming from farther North, so I plan to keep mine out longer this year. I love watching them. They do like red. Before my husband passed away we did a lot of camping & he wore a red billed cap, the hummingbirds would come right up to his hat & hoover over it. Such beautiful birds. Live in Lombard, IL (25 miles west of Chicago). A green hummingbird has been visiting our feeder all week long. SO EXCITING!!! Hadn’t seen “my” hummers for 2 whole days – then early this morning one was at the feeder. Of course I don’t know if this is one of ours or one passing through. Leaving my feeder up! You are not stopping her from migrating. You can keep feeding her. 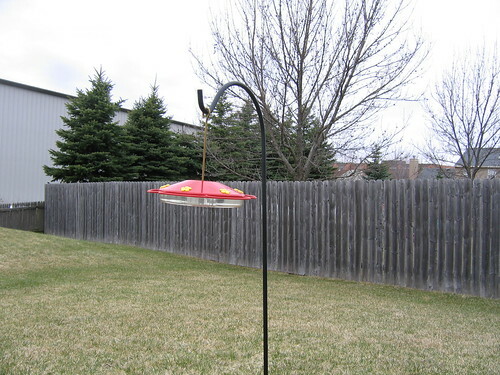 There are some tips here about keeping the feeder accessible: http://www.hummingbirdmarket.com/hummingbird_articles/feeding_hummingbirds_in_the_cold.html. If you are in a Christmas Bird Count circle, local counters would appreciate knowing about your bird.